We’d love your help. 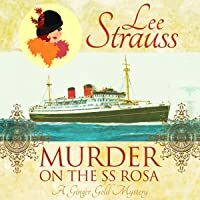 Let us know what’s wrong with this preview of Murder on the SS Rosa by Lee Strauss. The SS Rosa delivers a convincing array of suspects--the wife, the mistress, a It's 1923 and young war widow fashionista Ginger Gold makes a cross-Atlantic journey with her companion Haley Higgins to London England to settle her father's estate. When the ship's captain is found dead, Ginger is only too happy to lend her assistance to the handsome Chief Inspector Basil Reed. To ask other readers questions about Murder on the SS Rosa, please sign up. Welcome to the time of Prohibition, cloche hats and Charleston. The time when the world was still recovering from the first great war and British nobility titles still had a lot of weight. In this case I am talking about the year of 1923. A young widow Ginger Gold was crossing the Atlantic from US to GB to settle her late father's estate accompanied by her friend Haley Higgins. The women belong to completely different social classes, but the war - he great equalizer - made them friends. Ginger b Welcome to the time of Prohibition, cloche hats and Charleston. while Haley mostly played a recluse studying hard to be accepted into a nursing college in London. An unexpected and fairly gruesome death revealed the women's hidden talents: Haley turned out to be a competent autopsy surgeon (she was a field nurse during the war) and Ginger made a good amateur sleuth (she was in a secret service during the aforementioned war). With these two and an undercover Scotland Yard inspector the villain really had no chance of getting away with from justice. The first thing you notice reading the book is the skill with which the atmosphere of the time is recreated. Please do not get me wrong, I did not see that time. Come to think about it my oldest grandmother was too young to remember, bu at least she was already born. What I am trying to say is that what I have in my imagination about the time period in question is matched exactly here. And not just match, but the depiction adds its own colors and flavors making me traveling back through time when I picked the book up. What a wonderful surprise this was! I love cozy mysteries, as I've said a thousand times, so I'm always looking for ones that interest me. This one met everything I love about this genre. Characters that are interesting with some humor and sarcasm, interesting time period--the 20's! !, and a mystery that keeps you entertained, plus a cute lovely dog to add to the mix. I cannot wait to read more about Ginger, Haley, and Basil! Rest assured I will be picking up the next book. **Thanks to Lee Strauss What a wonderful surprise this was! I love cozy mysteries, as I've said a thousand times, so I'm always looking for ones that interest me. This one met everything I love about this genre. Characters that are interesting with some humor and sarcasm, interesting time period--the 20's! !, and a mystery that keeps you entertained, plus a cute lovely dog to add to the mix. I cannot wait to read more about Ginger, Haley, and Basil! Rest assured I will be picking up the next book. Mrs. Ginger Gold is traveling back to her native England on the S.S. Rosa. England is a place she hasn't been to since 1918 when the war ended and she was left a young widow. Now her father is also dead and she is left to settle his estate. Why not have a little fun before completing the task, especially while in non-American waters (Prohibition need not apply)?! Her traveling companion, Haley, would rather study for medical school and her Boston Terrier Puppy needs lots of attention. Ah well, there's plenty to keep her busy on a sea voyage, even a handsome (but sadly married) man. Then the captain turns up dead and Ginger's senses are awakened. She hasn't had to use her brain much since the war and noticing details is what she does best. With the help of a stowaway urchin and her puppy, Ginger sets out to solve the mystery, much to the dismay of the detective! This is long for a novella. I expected it to end about 2 chapters before it did. The Kindle edition is 161 pages which qualifies for novel, in my opinion. The set up took a long time and I almost put the book down. 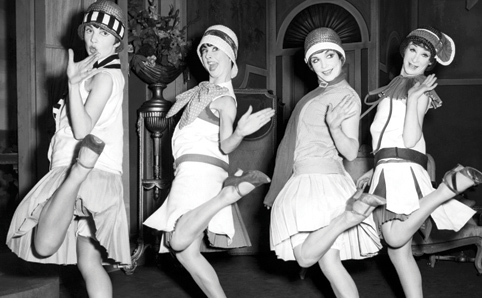 I didn't like the roaring 20s lifestyle. The 20s are too roaring for me. Then the mystery started and I couldn't put it down. I was impressed with the plot twists and never did figure out which character or characters did the deed until just before Ginger found out. Ginger has an interesting backstory and I'm eager to sign up for the author's newsletter to read Ginger's Journal and get some of that information. As she is now, she's a bit frivolous. She's smart and longs to be taken seriously but I don't see why she's so upset when a person's first impression is of a flighty, nosy young woman? I liked Haley much better. Haley's personality is more like my own. My favorite character is Boss, the Boston Terrier puppy. He's so cute and I was hoping he would play a larger role in the story. His new friend and caretaker is also a great character. He was raised right and I feel sorry for him now his mother has passed. The kid has a strong sense of family loyalty though and I admire that. The suspect list includes all the other characters: Mrs. Walsh, the captain's wife; Nancy Gilford a famous actress; Babineaux, the chef and Chief Officer MacIntosh. Everyone had a reason to loathe the captain except maybe Nancy. Captain Walsh was a ladies' man and horrid to his wife. Nancy's open flirtation with him angers Mrs. Walsh and she takes to drinking. She isn't very likeable but she has reason to be suspicious of beautiful young women like Ginger. I feel very sorry for her. Nancy is also unlikable because she openly pursues a married man in front of his wife. She is also demanding and awful to her maid/companion Paula. Paula is too kind, timid and subservient to Nancy. Babineaux sounds like an incredible chef but a passionate Frenchman who had motive, means and opportunity. Did he do it? Chief Officer MacIntosh isn't in the book much and is a very forgettable character. I am happy to hear that Murder on the SS Rosa is a prequel to a series of cozy mysteries featuring Ginger Gold and her friend Haley Harrigan. I am sure we will also see more of the intrepid and enigmatic Chief Inspector Basil Reed. At first I wasn’t sure what to think of Ginger Gold. At first glance she appeared to be all surface and fluff, especially in contrast to Haley – a serious medical student, which was highly unusual for a woman in the 1920’s. However, when the going goes sideways with a I am happy to hear that Murder on the SS Rosa is a prequel to a series of cozy mysteries featuring Ginger Gold and her friend Haley Harrigan. I am sure we will also see more of the intrepid and enigmatic Chief Inspector Basil Reed. At first I wasn’t sure what to think of Ginger Gold. At first glance she appeared to be all surface and fluff, especially in contrast to Haley – a serious medical student, which was highly unusual for a woman in the 1920’s. However, when the going goes sideways with a murder, Ginger Gold started to shine. Her boldness and deductive reasoning powers demonstrated that she is far more than dozens of designer outfits! In a way, a shipboard murder would be helpful since the suspect list is narrowed to those aboard ship. On the other hand, it is also high-risk: there they are, out on the Atlantic ocean, and poking a hornet’s nest when they have nowhere to run. Fortunately, Ginger’s many talents and skills with maneuvering people while applying subtle pressure (covered up by her fluff, of course) helped to solve the murder. This was a very enjoyable and relaxing read. The decade of the 1920’s is fascinating to me and it was a lot of fun reading about the fashions and “new inventions” of the time. I look forward to future releases in this series and recommend this prequel to all cozy mystery fans! Omg I loved it!Such a quick and action packed read. This was my first book by the author and it sure will not be last.I just loved how atmospheric this story was.Details really made this book for me.I can't wait to read more about Ginger and her adventures. And Can we just talk about this beautiful cover,its so stunning and perfect for this book! This was a freebie on Kindle, and as I enjoy period murder/mysteries and cozy mysteries, I thought I would give it a try. The year is 1923, Lady Ginger Gold is a young war widow whose father has recently passed away. She is setting off from Boston to England to settle his estate on the SS Rosa with her French Bull dog, Boss, and her good friend Haley Higgins. Haley happens to be the nurse who took care of her father and is going to England to attend university to become a doctor. The two have bon This was a freebie on Kindle, and as I enjoy period murder/mysteries and cozy mysteries, I thought I would give it a try. The year is 1923, Lady Ginger Gold is a young war widow whose father has recently passed away. She is setting off from Boston to England to settle his estate on the SS Rosa with her French Bull dog, Boss, and her good friend Haley Higgins. Haley happens to be the nurse who took care of her father and is going to England to attend university to become a doctor. The two have bonded despite being from different backgrounds. Expecting to have an enjoyable voyage, Ginger and Haley are soon involved in solving a murder...the ship's Captain. This is a prequel to a new series for this author, who is new to me. I found it an enjoyable, quick easy read. Mrs. Gold is a fashionista with clever mind and a soft heart. Haley Higgins is a no-nonsense practical young lady with a strong desire to learn. I was able to determine, through the clues uncovered, who one of the culprits were. However, based on the events, there was another who assisted. I did not figure that one out! But this is just the beginning of Ginger's troubles. Being a fan of both cozy mysteries and Lee Strauss’ writing I was really looking forward to reading the start to her new series. I’m pleased to say that there is so much to be enjoyed. It’s always important for a cozy mystery to have a sleuth (and sidekick) that readers warm to, and Mrs Strauss has certainly hit on a winner with Ginger and her friend Haley. And, not forgetting Ginger’s Boston Terrier, Boss, who I’m sure will continue to be part of the mystery-solving team. The era and the setting Being a fan of both cozy mysteries and Lee Strauss’ writing I was really looking forward to reading the start to her new series. I’m pleased to say that there is so much to be enjoyed. The era and the setting are perfectly evoked, and I particularly enjoyed the descriptions of the clothes. (I rather suspect that the author is a fan of 1920s fashion!) It was easy to picture and feel what it was like to be on the SS Rosa. The mystery, although not over-complex due to the short length of the book, was intriguing, and the characters were well-rounded and varied. I particularly liked young Scout. Mrs Strauss gives us a good introduction to Ginger and Haley and I’m looking forward to finding out more about them as the series progresses. All in all, I found the book well-written and am looking forward to Ginger and Haley’s next case. A review copy of this book was sent to me by the author. All of the above opinions are my own. I enjoy reading cozy mysteries and am constantly downloading the free offers from various authors. I am thrilled I read this particular mystery. The characters-especially Ginger and Haley-were whimsical and fun, especially when Ginger involves herself in a murder investigation much to the annoyance of the investigator Basil Reed. The setting of the ship and Lee Strauss' description of the food, the time period's clothing and social structure on the ship transported me in time. It was a genuinely I enjoy reading cozy mysteries and am constantly downloading the free offers from various authors. I am thrilled I read this particular mystery. The characters-especially Ginger and Haley-were whimsical and fun, especially when Ginger involves herself in a murder investigation much to the annoyance of the investigator Basil Reed. The setting of the ship and Lee Strauss' description of the food, the time period's clothing and social structure on the ship transported me in time. It was a genuinely fun, quick read and I would recommend to those who love a good mystery-it definitely had me guessing to the end! Lee Strauss is a new author to me and this is a new cozy mystery series by her. It takes place a few year after WWI aboard a ship (the SS Rosa) crossing the Atlantic from the U.S. headed to London. Ginger Gold is a fairly young widow who's more than the wealthy fashionista she appears to be. Traveling with her Boston Terrier, Boss, and her friend, Haley Higgins, a nurse who's going to England to attend medical school, she helps solve the murder of the ship's captain. I enjoyed this book set in 19 Lee Strauss is a new author to me and this is a new cozy mystery series by her. It takes place a few year after WWI aboard a ship (the SS Rosa) crossing the Atlantic from the U.S. headed to London. Ginger Gold is a fairly young widow who's more than the wealthy fashionista she appears to be. Traveling with her Boston Terrier, Boss, and her friend, Haley Higgins, a nurse who's going to England to attend medical school, she helps solve the murder of the ship's captain. I enjoyed this book set in 1923. The author described the hairstyles and clothing so well, I could easily picture it as I read. Ginger turns out to be more than just a wealthy young woman who loves dressing up and dancing. She was some sort of spy during the war, but we aren't told exactly what she did. I hope the author tells us more about that in future books. I liked that she and Haley are friends even though they're from different social classes--the war brought them together, and when Ginger's father was very sick, before he died, she requested Haley to be his nurse. They're very different--Ginger loves clothes and dressing up and going dancing while Haley tends to be quiet, serious and very studious. When you have an amateur detective, you always have to overcome the hurdle of how to involve them when official investigations. Ginger involves herself through a combination of frank nosiness and chutzpah which I just could not believe worked, especially when questioning various suspects. So, while Ginger (sporting looks, intelligence, wealth, and a spy background) was readable enough, and I thought Ginger's companion very interesting, I found myself drifting away from the story once the investig When you have an amateur detective, you always have to overcome the hurdle of how to involve them when official investigations. Ginger involves herself through a combination of frank nosiness and chutzpah which I just could not believe worked, especially when questioning various suspects. This is a prequel novella that I picked up as a kindle freebie awhile back. It was actually quite cute. The series is set in the early 1920's and features a woman named Ginger Gold and her friend Haley Higgins. Ginger is a 30 year old widow who lost her husband in the war. Haley was Ginger's late father's nurse, and the two struck up a friendship. Ginger also had some involvement in the war herself as an operative of some type. This novella (183 pages, according to my kindle) finds Ginger and Hale This is a prequel novella that I picked up as a kindle freebie awhile back. This novella (183 pages, according to my kindle) finds Ginger and Haley on a ship their way to London. Ginger is going to settle her father's estate, and Haley to further her medical studies. Along the way the ship's captain winds up dead, and Ginger, along with Haley, and the dashing Inspector Basil Reed sets out to discover the murderer. Oh! And there's a doggie named Boss (short for Boston)! This was okay [I found it better than the other book that had a murder on a ship - I cannot even remember the name of that one] - I liked the main characters and found the relationship between Haley and Ginger both sweet and hilarious. And the murder was a bit of a surprise. As was the reveal. But still...it felt like something was missing. And I am not sure what it was. I just cannot put my finger on it. I WILL read the second one because these characters have interested me enough to keep me re This was okay [I found it better than the other book that had a murder on a ship - I cannot even remember the name of that one] - I liked the main characters and found the relationship between Haley and Ginger both sweet and hilarious. And the murder was a bit of a surprise. As was the reveal. But still...it felt like something was missing. And I am not sure what it was. I just cannot put my finger on it. 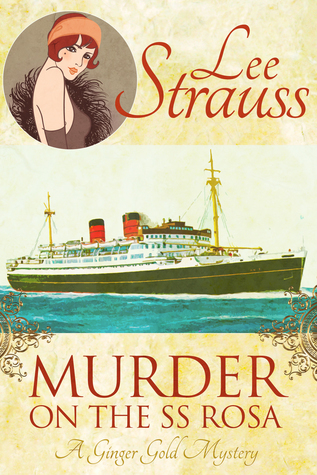 Murder on the S. S. Rosa by Lee Strauss is a short prequel to the Ginger Gold co In 1923, young war widow Ginger Gold boards the S.S. Rosa, bound from Boston to Liverpool, to settle her late father’s estate in London. A few nights into the voyage, the captain of the vessel is found murdered, and among the long list of possible suspects is one Ginger Gold. With the help of her traveling companion, Haley Higgins, she’s determined to help CI Basil Reed, a passenger on the ship, find the real killer. Very silly, superficial novella borrowed through kindle unlimited program that should fit the bill for people looking for quick read. It is meant to whet the appetite to read succeeding tales as many readers may do. Not this reader. A quick and delightful mystery! If this story was a drink, for me, it would be the champagne bubbles tickling my nose. It is quite effervescent and an immensely enjoyable fluff read. It's the Roaring 20's and Ginger Gold is sailing on the SS Rosa to settle her father's estate in England when the captain is murdered. Everyone is a suspect and Ginger is happy to assist the handsome Chief Inspector in any way she can. A delightful mystery that kept me guessing until the very end. Reminded me of Dame Christie with witty dialogue and intriguing characters. Highly recommend! This short novel is a historical fiction mystery taking place in the 1920s, on a ship sailing from the states to England. The main character is Georgia "Ginger" Gold, who used to be a secret operative during the war, but who after the war turned to detective work as a hobby to add some mystery and color to her now-average life. Ginger sets sail from the mainland on the SS Rosa, captained by a man named Joseph Walsh, and heads for England, where she intends to attend to her deceased father's Londo This short novel is a historical fiction mystery taking place in the 1920s, on a ship sailing from the states to England. The main character is Georgia "Ginger" Gold, who used to be a secret operative during the war, but who after the war turned to detective work as a hobby to add some mystery and color to her now-average life. Ginger sets sail from the mainland on the SS Rosa, captained by a man named Joseph Walsh, and heads for England, where she intends to attend to her deceased father's London estate (called Hartigan House). The seas are calm for much of the trip, but things on board turn anything but, when the captain's body is discovered stuffed in a pickle barrel in the ship pantry. The list of suspects grows longer and longer as more and more information comes forward. Although Ginger started trying to solve the mystery simply to pass time and to catch the culprit, it soon becomes a matter of having to clear her own name when she finds herself added to the list! I really enjoyed this book. It was a good, clean story with a good plot, and the mystery was hard but not impossible for the reader to solve, as the author scattered clues here and there to help you out. I highly recommend it for mystery lovers of all ages over 12 (because while rather clean, it contains some innuendo, and the plot contains a married man having an affair). I can't wait to read the second in the series! A very enjoyable read. I enjoyed the characters, the mystery and the setting aboard ship. My favorite character was probably Ginger's friend, Haley Higgins. They are opposites in many respects, yet I love the interplay between them. Fun and very believable. I also liked the way Ginger's past is hinted at instead of everything revealed at one time. The only thing which seemed very unrealistic was the way Inspector Reed allowed Ginger to hone in on his case, especially since he considered her a su A very enjoyable read. I enjoyed the characters, the mystery and the setting aboard ship. My favorite character was probably Ginger's friend, Haley Higgins. They are opposites in many respects, yet I love the interplay between them. Fun and very believable. I also liked the way Ginger's past is hinted at instead of everything revealed at one time. The only thing which seemed very unrealistic was the way Inspector Reed allowed Ginger to hone in on his case, especially since he considered her a suspect. However, since the book is a novella and not a full-length novel, I suspect the author just did not have enough time to flesh out the introduction between Ginger and Basil Reed in a fuller and more satisfying manner. Having read books 4 through 6 in this series, it’s time I catch up on the previous books starting with this first book in the Ginger Gold series. It’s a good first novel as it introduces the main characters, Ginger Gold, her close friend and travel companion Haley Higgins, and Chief Inspector Basil Reed, along with Ginger’s Boston Terrier, Boss, and young Scout, who has been smuggled on board the SS Rosa by his older cousin, Marvin. These characters carry through in the later books in the series Having read books 4 through 6 in this series, it’s time I catch up on the previous books starting with this first book in the Ginger Gold series. It’s a good first novel as it introduces the main characters, Ginger Gold, her close friend and travel companion Haley Higgins, and Chief Inspector Basil Reed, along with Ginger’s Boston Terrier, Boss, and young Scout, who has been smuggled on board the SS Rosa by his older cousin, Marvin. These characters carry through in the later books in the series. I appreciated getting to know the background of both Ginger and Haley. The murder onboard the SS Rosa has fewer suspects than some of the latter books but it’s a perfect scenario for the first book in the series. I do appreciate the complexity of the latter books. Wow!!! I really enjoyed reading this book. It was a fast pace, fun read. I could not put it down and was disappointed when I reached the ending. I was so engrossed that I did not realized an hour had passed. I found the main characters, Ginger Gold and Chief Inspector Basil Reed, refreshing and intreiging. They were not the typical over the top annoying know it alls. They truly complemented one another. Neither had to prove anything to the other. The ending was refreshingly different. You did no Wow!!! I really enjoyed reading this book. It was a fast pace, fun read. I could not put it down and was disappointed when I reached the ending. I was so engrossed that I did not realized an hour had passed. I found the main characters, Ginger Gold and Chief Inspector Basil Reed, refreshing and intreiging. They were not the typical over the top annoying know it alls. They truly complemented one another. Neither had to prove anything to the other. The ending was refreshingly different. You did not have to many suspects to choose from, But Alison Golden crafted a well written, suspenful story with a few clues thrown in to help solve the murder of the ship's Captain and why. Yes, this book is a good clean read (no bad language). That is a major plus for me because I can recommend it to my granddaughter's who are always looking for a good mystery to read. This was my first Lee Strauss Novel and it was an enjoyable read. I fell in love instantly with the characters. 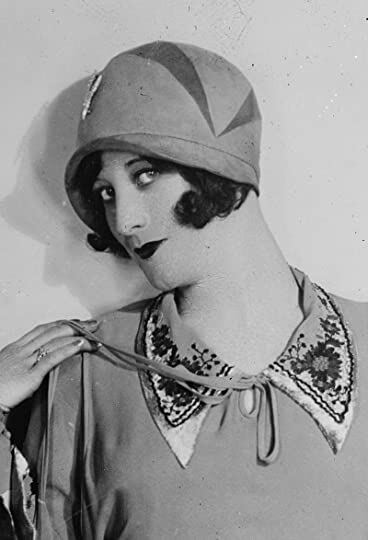 Ginger, the main character pretends to be a woman only concerned with the lasted fashion and high society events, but in reality, she had been an operative in WWI and is clever in gathering intel and observation. Basil, the inspector is a very intelligent and honest men since the beginning. Her companion and friend, Hailey, is a feminist and a nurse who is studyi Enjoyable Cozy Mystery! It's been a long time since I have been able to call a book delightful, but this one is. The main character is charming and fun, while the other characters balance out the cast. The story moves along at a nice clip, and every character and action is designed to move along the story. I particularly enjoyed the bits with Boss both as a tension reliever and as a way to show more of Ginger's demeanor. 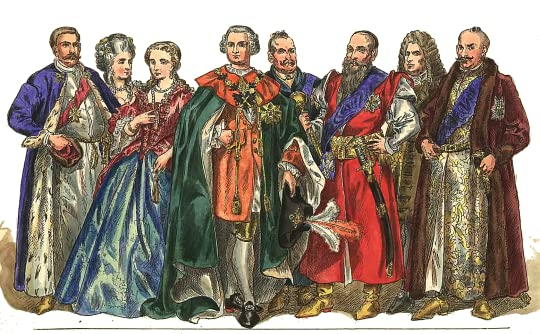 This was more a novella about fashionable clothes of the period than a murder mystery. Take away the descriptions of clothing and the frankly repulsive Boston terrier 'Boss' and you'd be left with very little else. Solving the murder was almost an afterthought and there was no suspense or intrigue. For a protagonist who I am supposed to like, Mrs Gold is smug, self-centred and supercilious. I don't think I'll bother with any more of these books. A refreshing easy read, just the thing for a quiet, relaxing, get-away weekend or vacation, or even a few minutes of escape during ordinary days at home. A real treat! I found this book very enjoyable. Taking place on a cruise ship I pictured the cruise ship I was recently on while reading the story. Looking forward to ready the next ones. A delightfully light read in the tradition of the classic British cozy mystery. Full of the fashion and mores of the 1920's, this book will fill a pleasant afternoon. Just the book to take you away from the humdrum of modern daily life. A new author for me and the start of a great new cozy series. I enjoyed this very much! One of the top ten books I've read this Year! Great job putting me in the twenties. The fashions and the makeup descriptions were superb, I cared about the characters, and the ship was fascinating. I felt immersed in the story. Lovely! Thank you Ms Strauss! As Lee Strauss, I'm a bestselling author of The Ginger Gold Mysteries series (cozy historical mystery), A Nursery Rhyme Suspense series (mystery sci-fi romantic suspense), The Perception series (young adult dystopian), and young adult historical fic Hi!